Dr. Jennifer Blum graduated from the University of Wisconsin-Madison College of Veterinary Medicine in May 2006. After graduation Dr. Blum and her husband, Charles, moved to the Mile-High City to experience the majestic Rockies first hand. One of Dr. Blum’s favorite quote: “Home is where your story begins” became a constant reminder of the distance from her family, and after a year they realized they needed to move back home. Dr. Blum currently lives with her loving husband, Charles and her adorable 9-year-old twin girls, Ava and Allison. Her family also consists of a free-willed Labrador retriever named, Eddy. Dr. Mey Nevo graduated from the University of Illinois College of Veterinary medicine in May 2007. She has had the opportunity to practice veterinary medicine in Illinois, Tennessee, New Jersey, and Minnesota while following her husband through his Small Animal Internal Medicine internship and residency. They finally settled down here in Minnesota to be closer to family. Dr. Nevo shares her life with her wonderful husband Dr. Steven Shadwick, her 6-year-old daughter Sophie, her 5 year-old son, Robert and her 2-year-old baby girl, Lucy. “These three little ones offer new and exciting challenges on a daily basis”. Her household also includes Scout, a 12-year-old Blue Healer mix, and the Nevo-Shadwicks are also privileged enough to be allowed to share a home with a 18-year-old cat Dublin who manages to keep the entire family in line. As you can guess it is very busy these days at the Nevo-Shadwick household!! Dr. Richard Reierson truly enjoys general practice, as well as long-time interests in surgery, dentistry, reproduction, and dermatology. Sporting dogs and their needs have been a particular favorite of his. When his son brought home a very unusual guest for Thanksgiving vacation, a snake, he decided to pursue reptile medicine. Dr. Reierson’s father, a dentist, provided the inspiration for his son’s ongoing education in advanced veterinary dentistry. A graduate of the University of Minnesota Veterinary School in 1971, Dr. Reierson also interned for one year at Colorado State University in small animal surgery and medicine. In 1976, he established Elm Creek Animal Hospital. He has served on the national board of the AAHA, Minnesota Veterinary Alumni board, and local humane society boards. Dr. Reierson has been a longtime member of the veterinary education committee of the M.V.M.A and takes an active role in mentoring students. In 2017, Dr. Reierson was named MVMA’s Veterinarian of the Year! Dr. Reierson’s interests are singing in two choirs and playing in a blue grass band. He has a passion for waterfowl and upland hunting, and enjoys caring for these sporting dogs. He is owned by his chocolate Labrador, Roxie, and relishes time spent with his four grandchildren. He is delighted to continue working for the new owners of Elm Creek Animal Hospital. Dr. Brett Duke is a lifelong resident of Minnesota, attended Gustavus Adolphus College, and then graduated in 1996 from the University of Minnesota College of Veterinary Medicine. Dr. Duke and his wife Lauri love to travel, yet have long enjoyed all that the Midwest and Northwoods have to offer. This includes camping, biking, snowshoeing, and attending MN professional and college sporting events. They enjoy hiking with their Border Collies, Trek, Punch and Teller. “We love the North Shore and any little towns that are off the beaten path.” They also keep very busy training and competing in the sport of canine agility, which has taken them all over the country to regional and national events. He has also been instructing agility students and their dogs for over 20 years. Dr. Duke’s professional career has led to special interests in sports medicine, dentistry, soft-tissue surgery, and small mammal medicine. He has undergone additional training in laser surgery, which he has been utilizing in practice for 15 years. He emphasizes the importance of the bond owners have with their pets, and strives to educated clients on all options available to provide the best care possible. Dr. Jo Croswell grew up in Northern Minnesota, but fell in love with the Twin Cities area after getting her Bachelor’s degree in Psychology from the University of Minnesota. From there, she moved to Michigan to attend veterinary school at Michigan State University and graduated with her DVM in 2014. She enjoyed discovering everything Michigan had to offer, but is excited to have moved back to Minnesota.Dr. Croswell loves to spend her spare time outdoors- whether it is enjoying time at the family cabin, canoeing in the Boundary Waters, or exploring the great local parks and restaurant patios. She is happily married to her husband Peter and they are kept busy at home with their comical pug, Goober, and their mellow cat, Abner. While Abner is content with his spot on the couch, Goober likes to join on as many adventures as he can- he even has his own camping backpack! In April of 2018, The Croswell family welcomed their first child, Annika. At work, Dr. Croswell really enjoys connecting with her patients and getting to know her clients. She has particular interests in behavior medicine, internal medicine and preventive care. She enjoys talking about puppy training as much as helping clients support their pets through their golden years. Dr. Croswell is excited to be a part of the Elm Creek Animal Hospital Team! We welcomed Dr. Zanol to Elm Creek in April of 2018, and she has quickly become a joy for our staff, clients and patients alike! Dr. Zanol completed her undergraduate from the University of MN in 2005, and her veterinary degree from Iowa State in 2010. Cocker spaniels have become her dog breed of choice, after meeting her husband’s sweet 13 year old Cocker Spaniel named Joe. She also has Jack, who she rescued in 2016, and Crush, her 5 year old orange tabby. Dr. Zanol and her husband, John, are newlyweds who like to fish, hike and camp. Crafting is her favorite hobby when she takes time away from helping animals! The backbone of Elm Creek Animal Hospital is the Animal Care Team. They treat and care for the animals, aid and assist the veterinarians, and help you make appointments. They work closely with you to answer questions, inform on treatments, and give direction on the healing process. All of our technicians have received a degree from an accredited Veterinary Technician school. Almost all have passed the state and national exam to make them Certified (CVT’s), or are in the process! Sarah joined the Elm Creek Animal Hospital team in 1999. She earned her CVT degree from the Medical Institute of Minnesota. Sarah’s favorite part of her job is seeing the bond that animals and their humans share! She shares her home with Fozzi, a 9-year old cockapoo, and two cats; Calvin, a 6-year old domestic medium hair, and Teddy, a 2-year old orange tabby. In her spare time, Sarah enjoys spending time with her kids. You will find her cheering them on at a variety of sports events. They also like to spend time camping, hiking and bicycling. Emily joined our team in 2009. She earned her education through the Minnesota School of Business. She enjoys puppies, dental cleanings and working with such a great team at ECAH! She has two dogs, both schipperke mixes. Rizzo, age 9 and Kenickie, age 11, are named after the movie ‘Grease!’ In her free time, Emily enjoys, movies, shopping, bingo, the MN Wild, and outdoor activities. Terri has been a part of the Elm Creek team since 2001. She holds her BSN degree from Bethel University and her CVT degree from Argosy University. When asked about her favorite part of her job, Terri said: ‘Dogs, dogs, and more dogs! I love seeing clients and their furry family members throughout the years. I remember some of our patients as brand new puppies and kittens who are now geriatric pets.’ Terri shares her home with several pets: Barley, an 8 year old pitbull mix, who is a rescue dog who now thinks he has a very important job of keeping her yard squirrel and rabbit free -Dude, a 6 year old Saint Bernard, a finished champion show dog, and Gabby, a 4 year old rescued French Bulldog, who is now the queen of the family home. In her free time, Terri enjoys spending time with her husband and two kids. She spends a lot of time driving kids to their activities, but when time allows, likes to paint, go to hockey games (go Wild), and knit. Beth has been an Elm Creek team member since 1997! She earned her CVT and education through Kirkwood Community College Small Animal Program and U of M Waseca. Dogs with smooshed noses are Beth’s specialty. She is owned by Toby, a pug she adopted through ECAH, after her husband said she could bring him home if he could get an HD TV, and Ned, a French Bulldog she rescued in 2016. In her spare time, Beth enjoys movies, craft shows and spending time with her daughter, April. 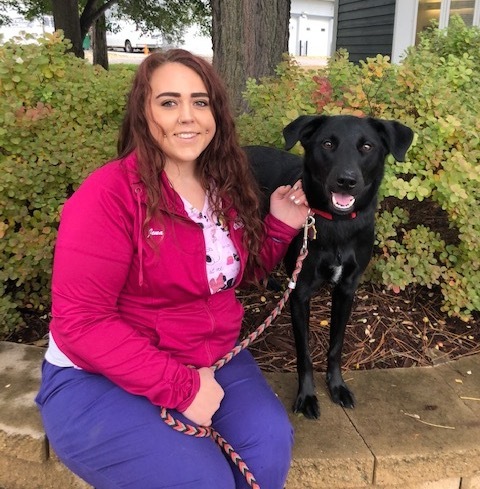 Kat joined the Elm Creek Animal Hospital team in 2015. She earned her AAS from the Minnesota School of Business. When asked about the best part of her job, Kat said she most enjoys ‘developing long lasting relationships with clients and their pets and watching patients grow from their first appointment.’ Kat has two dogs. Turbo, a 5 year old border collie mix, who enjoys spending the day with her at the clinic. Boost, a 7 year-old black lab retriever (AKA a fish-dog), who loves being in the water more than on land. In her free time, Kat enjoys outdoor motorsports such as snowmobiling and dirt bike riding. She also loves exploring Minnesota’s lakes and rivers on her kayak, with Turbo as the captain! Leslie joined the Elm Creek team in 2015. She attended the Medical Institute of Minnesota. She enjoys getting to know owners and their pets. She shares her home with Breezer, an 11 year old Golden Retriever, Shakey, a 19 year old domestic shorthair cat, and Fenwick, a carrot-loving guinea pig. Leslie has become very fond of our guinea pig patients and is often referred to as “The Guinea Pig Lady”. In her free time, Leslie enjoys fishing, waterskiing, and spending time with family and friends up north at the cabin. Brooke joined our team in 2016 and holds an AA degree from the Minnesota School of Business. Her favorite part of her job is the opportunity for client education. She shares her home with several pets: Nora Belle, an 8 year-old mini Rex rabbit who hates carrots, loves head rubs and runs agility courses. Chloe Beth, a 5 year-old Siamese Lynx point mix who begs for food every chance she gets, enjoys chewing on paper and leaves and is the number one bug catcher. Sammy Benson, a 4 year-old springer/setter mix, he’s a pro digger, pillow hog and extreme napper, and Finn, a 2 year-old german shepherd who is happy to let the rabbit be the boss. ​In her free time, Brooke enjoys Hoppy hour, rabbit agility, fostering animals, string art, restoring old furniture and boating. Samantha has been on the Elm Creek Animal Hospital team since 2008. Her favorite parts of her job are educating clients and of course, meeting all the cats! She has a Morgan horse, Melrose, and is also the very proud owner of Wall-E, a cat that was left here at Elm Creek as a kitten. She is also owned by a goofy shepherd mix named, Xena. Sam has a four-year-old daughter, Mallory, and a two year old son, Carson. Sam adores and loves spending time with her little ones! Some of her hobbies are riding her horse, cheering on the Vikings and snowmobiling. Alexa joined our team in July, 2018. She studied Veterinary Technology and Equine Science and loves working with animals in a scientific field. Her four-legged pals are two barn cats named Peter and Tuxedo, as well as an old Mustang named, Misty, who is lovingly referred to as a “pasture ornament”. In her free time, Alexa enjoys listening to music and hanging out with friends and family. Jena is our lead receptionist, and has been with us since 2016. In her spare time, she enjoys fishing and traveling. Northern Minnesota is one of her favorite destinations. Her favorite sport is hockey, and she loves the Minnesota Wild. Jena has 2 bunnies, Rupie and Lumi, and a rescue puppy, Rosie. Rosie is mischievous, and loves to unmake beds, dragging the blankets through the house. Lori joined the team in January of 2018. After working in retail for nearly half her life, she decided to make a career change and work with something she loves dearly, animals. Lori has a sheltie named, Dakota, and two cats, Siam and Ovechkin. When Lori isn’t working, her hobbies include making and selling her crafts. A favorite getaway is being up north at the cabin with her husband, Scott, and two children, Cassie and Brandon. Lori treasures both her family and friends.